Ultra X Sri Lanka com­pet­it­or and pro ultra run­ner Anna-Mar­ie Wat­son had a huge 2018 sea­son with enorm­ous back to back races (lis­ted below). Accord­ing to her she’d ‘crammed a cata­logue of mam­moth races back to back along­side work and life’, and was in need of a switch of codes. Anna-Mar­ie is a very keen triath­lete and an advoc­ate for cross train­ing. Below she takes us through her exper­i­ence at the IRONMAN 70.3 World Cham­pi­on­ships in South Africa. Her main events are lis­ted below. These races were argu­ably four of the toughest moun­tain and multi-stage events on the Inter­na­tion­al Ultra-Run­ning cal­en­dar. By the end of April, I was phys­ic­ally, men­tally and emo­tion­ally tired. My “Qual­ity over Quant­ity” man­tra had been broken by the tempta­tion, oppor­tun­ity and lure of races in sun­ni­er climes. It was time to step back, take a break and mix it up back in the triath­lon world. I’ve always enjoyed the pur­suit of a vari­ety of sports to bal­ance out my run­ning; a quick glance on Strava illus­trates this mix of cyc­ling, swim­ming and yoga amongst the run­ning, to the extent that my weekly run­ning load can be inter­preted as pretty ques­tion­able for an ultra-run­ner. 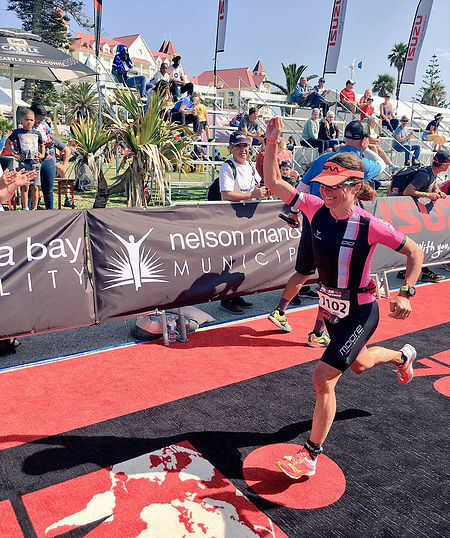 So, look­ing for a change the oppor­tun­ity to enter the IRONMAN 70.3 World Cham­pi­on­ships in Nel­son Bay in the East­ern Cape of South Africa was impossible to ignore. Thank­fully, the triath­lon gods were feel­ing favour­able and my 2nd in Age Group place at IRONMAN 70.3 Stafford­shire was enough to guar­an­tee me a slot in the 70.3 World Champs and just like that South Africa was con­firmed. It was the first time this event had been held on the Afric­an con­tin­ent with nearly 4,500 ath­letes trav­el­ling from over 90 coun­tries to take part. The sep­ar­ate ladies and mens races took place on Sat­urday 1st and Sunday 2nd Septem­ber respect­ively with plenty of chances to rub shoulders (at least from a dis­tance!) with top pros such as Javi­er Gomez, Alistair Brown­lee, Jan Frodeno, Daniela Ryf, Lucy Charles and Emma Pal­lant. The race star­ted from Kings Beach in Port Eliza­beth with a 1.9km swim in the Indi­an Ocean, a stun­ning 90km rolling cycle route up and over the Mait­lands before return­ing along the coast to fin­ish with a 21.1km run along the seafront. In line with all my triath­lon races, the swim is a bit of an ordeal to endure until the real race starts on the bike. Hav­ing even­tu­ally emerged from the ocean into T1 after 38 minutes, I soon began to make up places on the bike, espe­cially on the hil­li­er sec­tions. The final 25km snaked along the coast­line where it was a struggle to avoid the tempta­tion of stop­ping to admire the breath-tak­ing scenery. While the day had star­ted over­cast, once into T2 the sun appeared and tem­per­at­ures sky-rock­eted. As usu­al I set off onto the run course with a bit too much enthu­si­asm (i.e. too fast accord­ing to the Garmin! ), though I was feel­ing strong and decided to go with the flow. Luck­ily my gamble paid off clock­ing the 3rd fast­est run of the day in my Age Group, equalling (lit­er­ally to the second!) my pre­vi­ous Iron­man 70.3 Run PB of 1:32:27 for a total fin­ish time of 5:02:50 and 13th place in my Age Group out of 252 ath­letes. 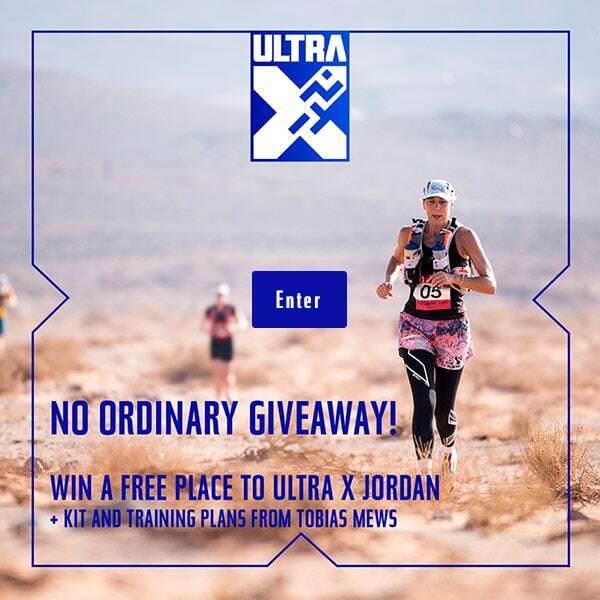 While I enjoy the sport of triath­lon and it’s been an excel­lent mid-sea­son break, it’s done and I am ready to dig out my trail shoes and return to the ultra-run­ning world. The switch into triath­lon served it’s pur­pose per­fectly and I’m very much return­ing to the ultra world with thirst. If you’re suf­fer­ing from a lack of motiv­a­tion when run­ning or strug­gling with burn out, an option could be to switch things up with triath­lon, it works well for me. Places are avail­able to join Anna-Mar­ie in Sri Lanka until the end of Janu­ary 2019.